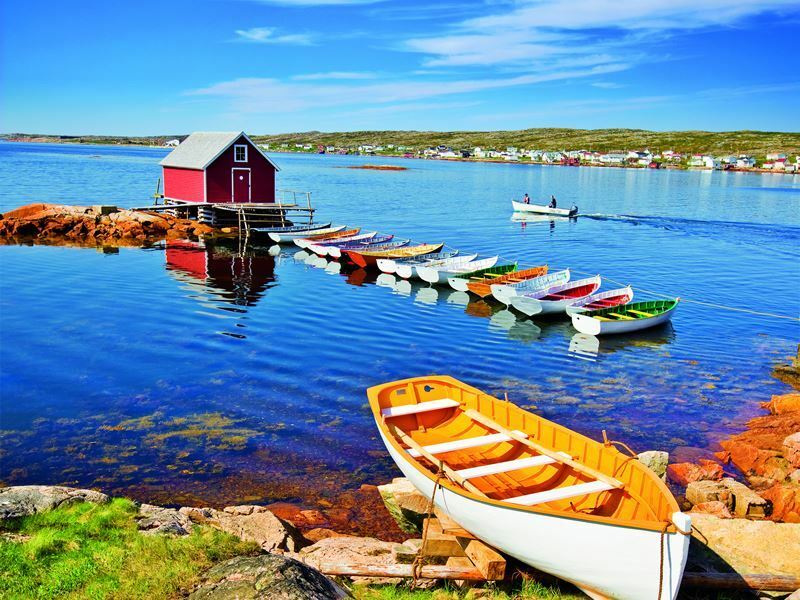 While Newfoundland and Labrador isn’t a destination frequently mentioned on travel bucket lists, it certainly should be, and for those who live in the U.K., it’s just a hop, skip and a jump – directly west of Ireland as Canada’s easternmost province. Often referred to as a kind of “mini-Canada,” it offers a little bit of everything the nation is known for, other than large cities, from soaring mountains and dense forests to fjords, countless glistening lakes and streams, breathtakingly wild coastlines, unique islands and an abundance of wildlife. One thing that stands out when it comes to Newfoundland, is that it offers the feel of “Old Ireland,” with residents in many of its regions, particularly around the “Irish Loop,” frequently referred to as the most Irish place on the planet outside of Ireland, sounding as if they just arrived from the Emerald Isle. Many are descended from the Irish who arrived here in the 18th and 19th centuries, and the “Newfies” still have a similar Irish lilt despite being here for generations. This strong connection to the nearest land directly to the east, also results in a wealth of local, live Celtic music that can be enjoyed throughout the province on just about any given night of the week, including St. John’s famous George Street which boasts more pubs and bars per square foot of any street in North America. Newfoundland and Labrador is a wildlife enthusiasts’ dream, home to an abundance of bald eagles, puffins, moose, and bears. In fact, there are nearly 30 different varieties of marine mammals, with more species, seen more often in more destinations in this province than anywhere else in North America. All around its shorelines, or out on the water, you may be able to see orca, minke, sperm, pothead, blue and humpback whales. This is home to the largest concentration of humpbacks on Earth, which feed on capelin, krill and squid along the coast. From May through September, with peak time mid-June through mid-August, they can often be seen breaching the surface. Humpbacks are arguably the biggest attraction when it comes to whales, and you’ll have a wide range of options for viewing them. 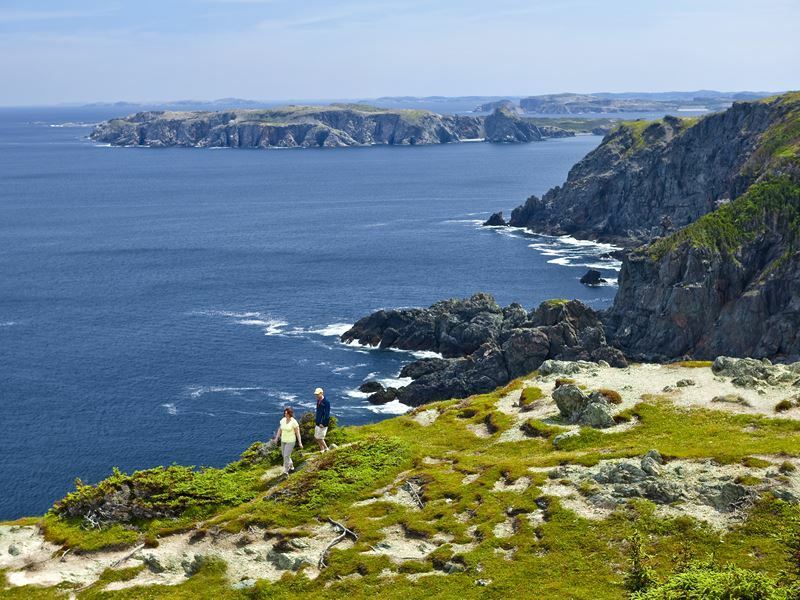 While you might see their spouts from just about anywhere along the coast, some of the most spectacular viewing places include Signal Hill, Cape Spear and Witless Bay near St. John’s, Trinity, Twillingate, Cape St. Mary’s and St. Anthony. Two of the best tour operators include Sea of Whales Adventures out of Trinity, a village so pretty, it looks like it must be a film set. Owner Kris Prince will take you out to watch for the whales in a zodiac boat for a more intimate experience with groups kept to a maximum of 11 passengers. 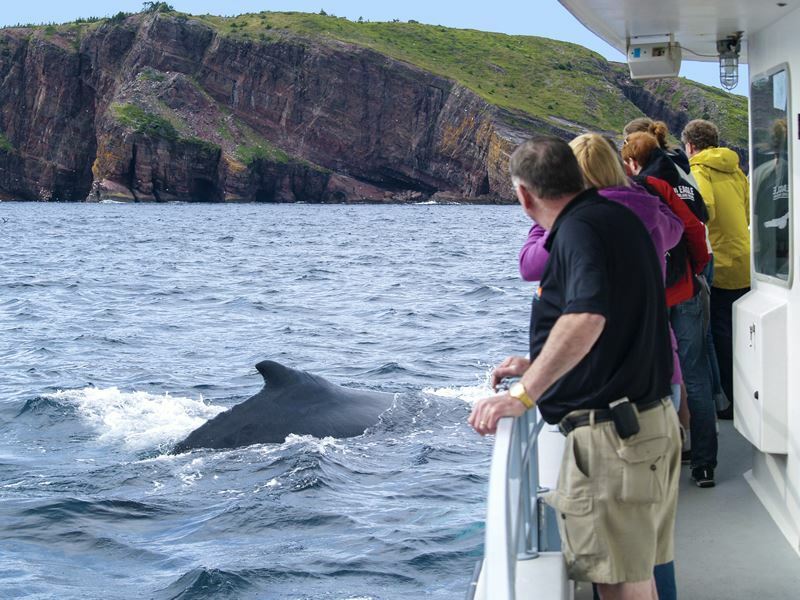 On the Great Northern Peninsula in St. Anthony, Northern Discovery Iceberg & Whale Tours offers incredible excursions with the boats often surrounded by the magnificent creatures. Those adorable seabirds known as puffins, can be found in abundance here too, with the very best spot for close encounters in Elliston, about 40-minutes north of Trinity. Between May and September, a section of land that lies at the end of a rocky outcrop, “Puffin Island” or “Bird Island Cove” as it’s also called, serves as the home of thousands of pairs. You’ll see them wandering about the rocks and whizzing through the air, all around you. If you want to see them closer to the capital city, head to the Witless Bay Ecological Reserve. You’ll often hear Newfoundlanders say, “Mind the moose,” and there’s a good reason for that – they’re everywhere, with some 150,000 inhabiting this province. Pay close attention to the roadside as you drive for safety reasons, and to spot a few. One of the best places to see them is in Gros Morne National Park, home to around 7,000 to 8,000 of the animals as one of the highest moose densities in the world. There are anywhere from 6,000 to 10,000 black bears in Newfoundland, with most of these coastal animals in and around Gross Morne and Terra Nova national parks. 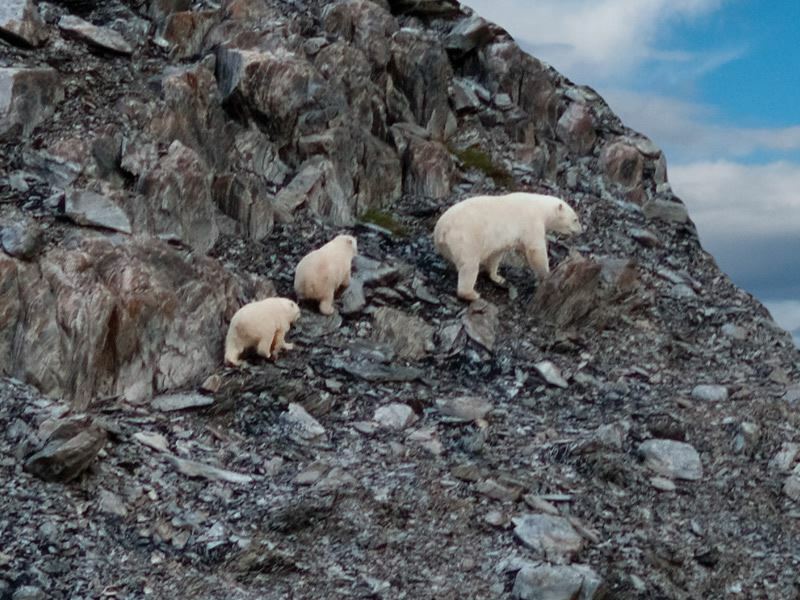 It is possible to sight polar bears too, which come in through the abundant pack ice off Labrador and northern Newfoundland, though viewings aren’t common unless you head to remote wilderness areas like Labrador’s Torngat Mountains National Park, a place where Inuit live like they’ve done for thousands of years. Stretching from Saglek Fjord to the northern tip of Labrador, and west from the Atlantic to the border of Quebec, accessing this more than 3,700-square-mile region requires hiring a charter or utilising the services of Torngat Mountains Base Camp. Following a route referred to as "Iceberg Alley," an abundance of glistening white and blue icebergs float from the glaciers of Greenland, down to the waters off Newfoundland's east and northern coasts. They typically arrive in May and stick around through mid-July, but you may sometimes still see a few as late as August or early September. 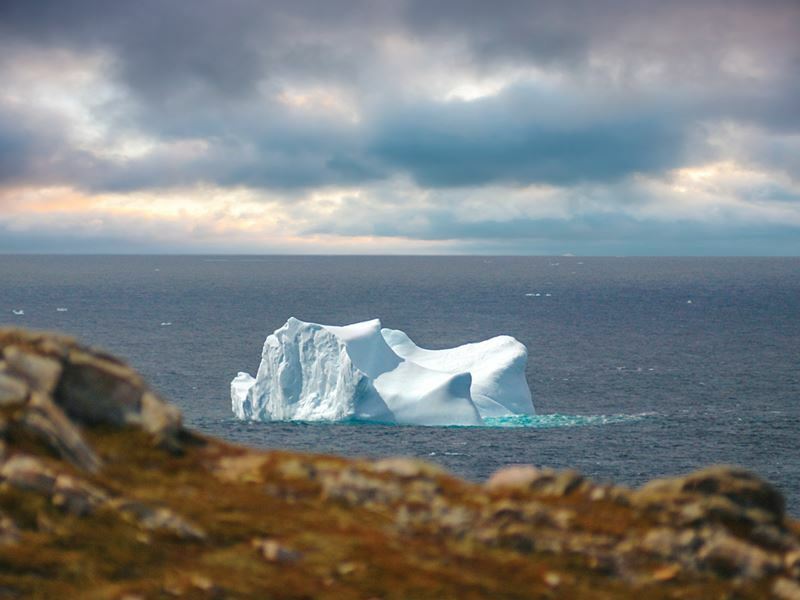 The best destinations for iceberg viewing can be found around the Great Northern Peninsula and Twillingate, along Newfoundland’s northeastern shores. Known as the “Iceberg Capital of the World,” by visiting Long Point Lighthouse, which sits at over 300 feet above sea level, you’ll get an outstanding vantage point and panoramic views of the iceberg-dotted Atlantic. As you gaze out at the 10,000-year-old bergs, you’ll breathe in some of the freshest sea air imaginable - be sure to bring your camera, along with extra batteries, as each one is like a unique work of art. On a side note, Twillingate also hosts the Auk Island Winery, which produces some interesting wines made from local berries as well as wines made with iceberg water. Here you can enjoy both a taste, a tour, and the homemade wine ice cream. In a land with such breathtaking, diverse scenery, you’ll find lots of opportunities for outdoor adventures in addition to wildlife watching. The favourites here are hiking, backpacking and kayaking, popular in the national parks and many other areas. 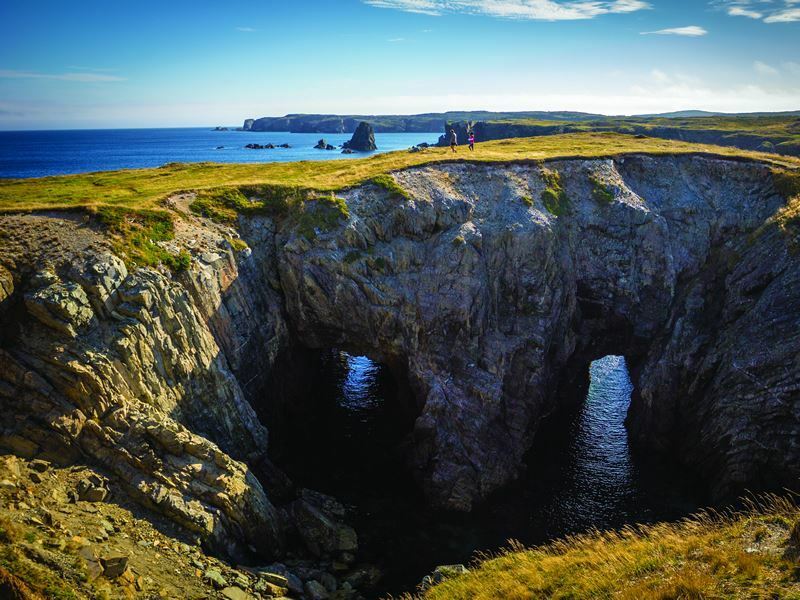 In fact, one of the world’s top-rated hikes can be found on the Bonavista Peninsula near the picturesque town of Trinity. The moderate, three-and-one-third-mile loop trail was once named among the top 35 walks in North America and Europe by Travel + Leisure magazine. You’ll wander through the woods and along the coast, looking down from the steep cliffs are hidden caves and arches, while just offshore are sea stacks, icebergs (typically May through mid-July) and whales in the summer. 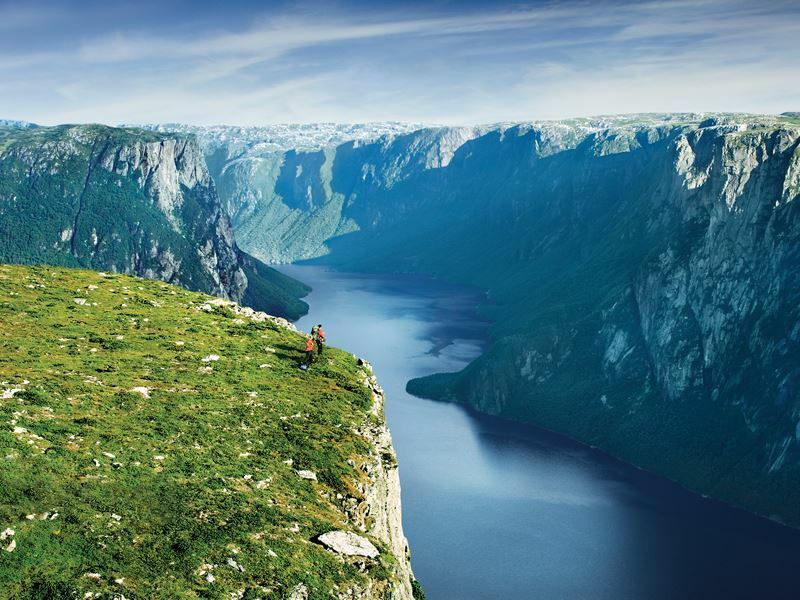 Gros Morne, which spans nearly 700 square miles of the Long Range Mountains, is a hiker’s paradise, filled with cascading waterfalls and wildlife as well as beautiful beaches and freshwater fjords. The Bakers Brook Falls hike is just over 5 miles round-trip, a flat, easy trek meandering through balsam fir forest to the series of cascades that plunge over limestone ridges. One of the most popular things to do in Gros Morne is to take the Western Pond Brook Tour. On the excursion you’ll see the incredible glacier-carved land-locked fjord, numerous waterfalls, billion-year-old cliffs and a variety of wildlife. Twillingate is one of the few Newfoundland destinations where sea kayaking and iceberg viewing can be combined. While the experienced can head out on their own, it’s best to hire an expert guide to learn more about the bergs and this majestic region of the world. All sorts of kayaking opportunities are available, from paddling to caves and inlets to secluded beaches and even offshore islands. Newfoundland and Labrador is a fabulous destination for history buffs too. 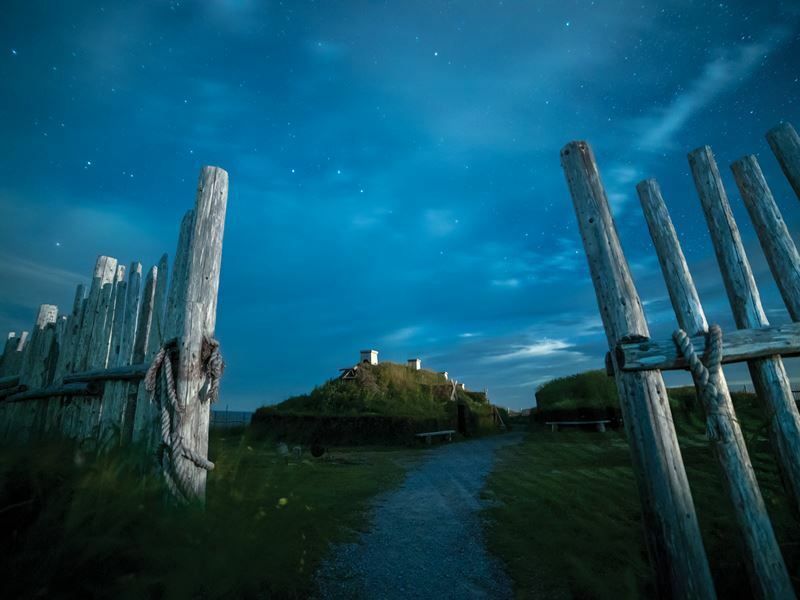 The world-famous Viking Site L’Anse aux Meadows, north of St. Anthony, is a national historical site that offers proof the Vikings set foot in North America around the year 1003 AD, long before Christopher Columbus. Situated at the very northern tip of the Great Northern Peninsula, it’s the continent’s only authenticated Viking settlement. Walk in the footsteps of the Vikings while touring the ruins and exploring a replicated longhouse, discovering what life might have been like more than 1,000 years ago. 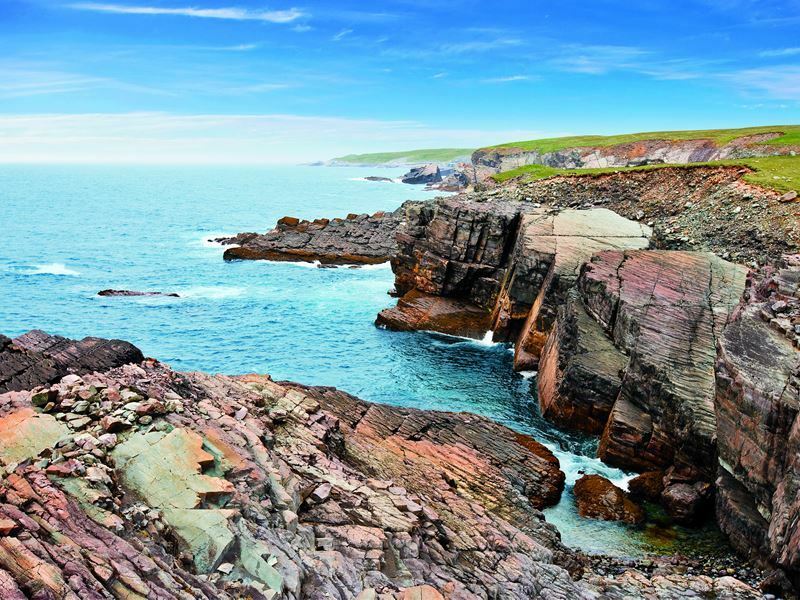 Mistaken Point, a cliff that was formed by the crashing waves off the coast of the Avalon Peninsula south of St. John’s, hosts the oldest complex life forms on the planet as well as the first appearance of skeletal organisms that are some 565 million years old. It’s all part of Newfoundland’s newest UNESCO World Heritage Site, Mistaken Point Ecological Reserve. Geologically significant, it was named as such as it once fooled sailors when enveloped in fog, with many mistaking it for nearby Cape Race. They would often crash their ships into the craggy edges – in fact, it occurred so often, this area is said to host some 50 shipwrecks. By visiting Labrador via ferry from St. Barbe, Newfoundland, you can visit the Red Bay National Historic Site, remnants of a 16th century Basque whaling station. This is where whalers from the Basque regions of France and Spain established a major whale port. Along the Red Bay shoreline, whale oil was rendered for lighting the lamps of Europe. Today, the former whaling town is a UNESCO World Heritage Site. There are multiple islands off the coast of Newfoundland and Labrador that are worth a day trip or an overnight stay. While it’s a tough decision, if you only have time for one, take the ferry from Farewell (near Twillingate) to Fogo Island and you’ll experience an entirely different world, home to 11 unique communities, each with its own appeal. In the traditional Irish village of Tilting, you’ll see lots of names like O’Keefe and Foley, and hear thick Irish lilts among the locals. 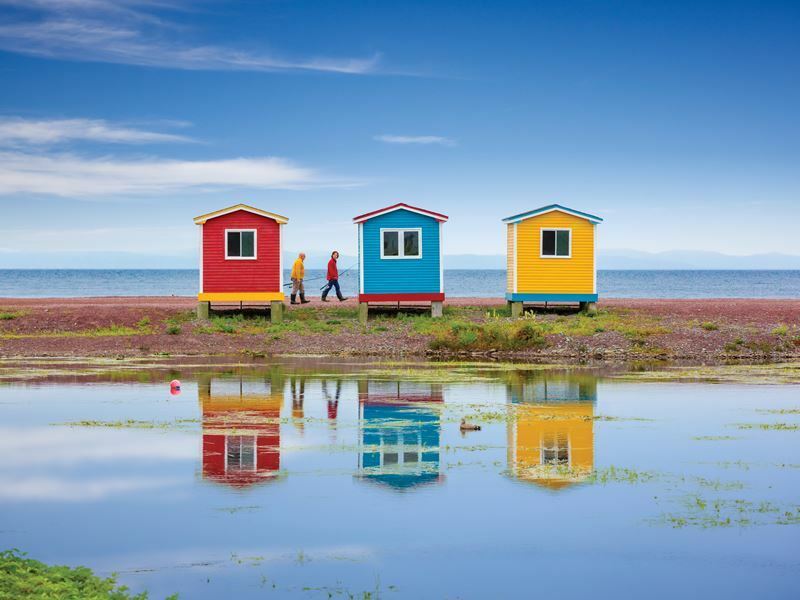 Wander through the tall grasses and snap photos of the red-hued fishing huts, dip your toes into the cool turquoise waters at Sandy Cove Beach, and look for the caribou that graze along the hills. There are multiple museums and art galleries filled with local works, as well as amazing hiking trails. Brimstone Head, accessible from the town of Fogo, is situated in one of the four corners of the Earth, according to the flat earth society. The main reason to take the trek up the dramatic landscape of rock, with steep terrain on both sides that plunges to azure waters below, is to soak up some of Fogo’s most jaw-dropping vistas. 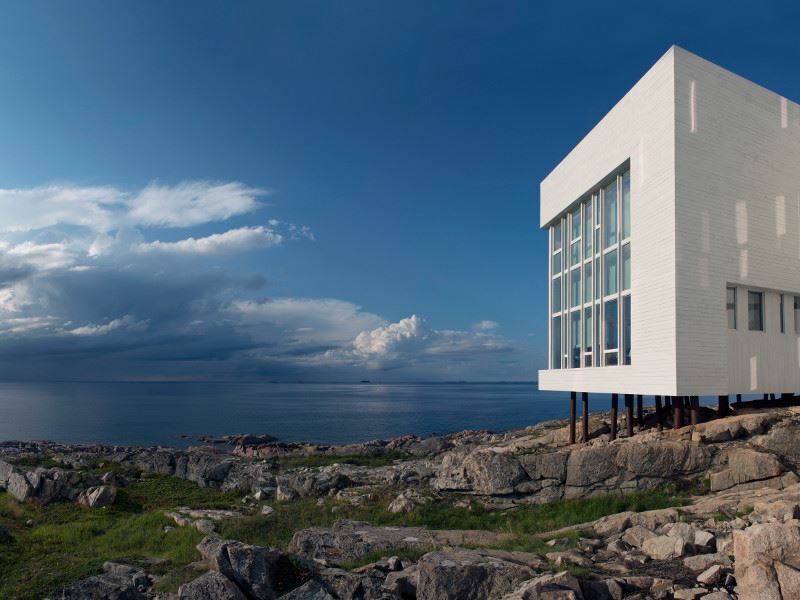 Even if you don’t spend the night, don’t miss visiting the luxurious Fogo Island Inn, known as the “hotel at the end of the Earth.” The pricey all-inclusive resort stands out with its unique modern architecture, lying along the rocky shores of Joe Batt’s Arm. It’s filled with beautiful handmade furniture and works of art, all produced by the locals to benefit the community. The walls of windows are ideal for watching whales or the icebergs that float by.